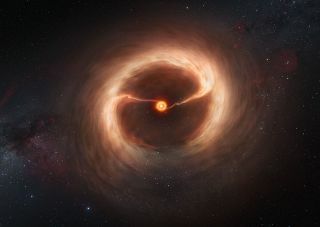 This artist’s impression shows the disk of gas and cosmic dust around the young star HD 142527. Astronomers using the Atacama Large Millimeter/submillimeter Array (ALMA) telescope have seen vast streams of gas flowing across the gap in the disc. These are the first direct observations of these streams. An international team of astronomers have used the partially completed Atacama Large Millimeter/submillimeter Array (ALMA) to study a young star about 450 light-years from Earth. They identified two thin filaments of gas streaming from the outer disk to the inner, across a broad gap cut by young planets. Far from Earth, the fledgling star HD 142527 is nearing the end of its formation process. Around 2 million years old, the young star is about twice as massive as the sun, though it is still slowly growing. A disk of spinning dust and gas left over from its formation surrounds the star, and from this material, planets are being created. As baby planets, or planetesimals, travel through the disk, they absorb the material around them, creating gaps. Such paths have been seen in a number of newborn systems. HD 142527 boasts a gap that starts at a point equivalent to Saturn's position in the solar system and extends outward 14 times as far. The gap, which scientists had previously measured, is so large that several planets would be required to clear it of debris. Using ALMA to observe the system, Casassus and his team have found that the gap is not completely empty. Two filaments reach from the outer disk to the inner, indicating that at least two young planets exist within the space. The gravity of the planets draws material from the outer ring inward. But while some of the gas and dust falls into orbit around the young gas giants, a fraction of it overshoots the planetesimals, traveling instead to the inner disk. Eventually, the star absorbs the material. These bridges are important to the continued growth of the system's young sun. The inner disk around the star is too small to sustain its growth; Casassus and his team concluded that the disk around HD 142527 would be depleted within a year without a bridge. Planets funneling material from the outer disk to the inner would help nourish their star. The process won't continue forever, however. "Eventually, the proto-gaseous giants will exhaust the material within their radius of influence," Casassus said. "How much material will have infallen, in what timescales, and how this impacts the planet location and eventual migration are all open questions in the field of planet formation. Our observations are a step forward." In addition to revealing the bridges between the two disks, ALMA's detailed measurements showed that the gaps weren't completely empty. Instead, they contain traces of carbon monoxide gas. "This residual gas was predicted by all dynamical calculations, but previous detections were not as clear-cut and direct as the ALMA result," Casassus said. The data was taken by ALMA during its first year of observation. The array of 66 telescopes, set up in Chile, is still under construction but should be completed this year, at which point Casassus plans to observe the system in greater detail. Although the dense gas of the filaments would obstruct a direct view of the young planets, studying the system at the higher resolution of the completed ALMA could reveal knots along the filaments that could signify their location. At the same time, a more precise examination of the leftover gas in the gaps could help astronomers to narrow down the mass of the developing planets. The research was published online today (Jan. 2) in the journal Nature.